As the third generation of their family to operate the Chinchilla store, Gerald and Frances Purves are big on tradition. 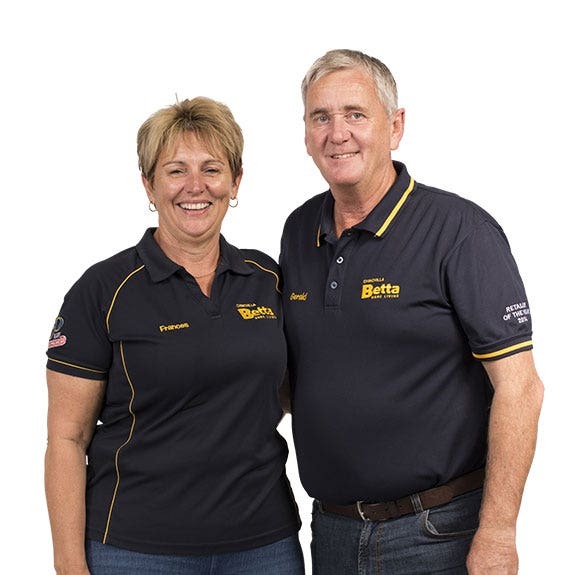 The team at Betta Chinchilla has unbeatable deals on a leading range of electronics and home appliances. They are dedicated to providing local advice on fridges, freezes, washing machines, dryers, TV and audio appliances. In store you'll see a range of brands including Beko, Bosch, Breville, Electrolux, Fisher & Paykel, LG, Panasonic, Samsung, Simpson, Sunbeam, SMEG, TCL, Westinghouse and Sealy. Chincilla Betta Home Living also offers delivery and installation services in Chinchilla. Terms and conditions apply. Locals to the area since 1960, they love the community spirit of Chinchilla and playing for the Chinchilla Bulldogs, the Chinchilla Bears, and the Chinchilla Golf Club. Gerald and Frances enjoy a flat white with no sugar and love dining at the Purple Bean Cafe.